I am back from a week in Germany, if you followed me on Instagram you might have seen it was an intense week of interior design inspiration, talks, lots of walking, I counted nearly 50 kilometers, lovely dinners and meetings with beautiful brands and friends. I started last week in Hannover where I was on invitation of Domotex. 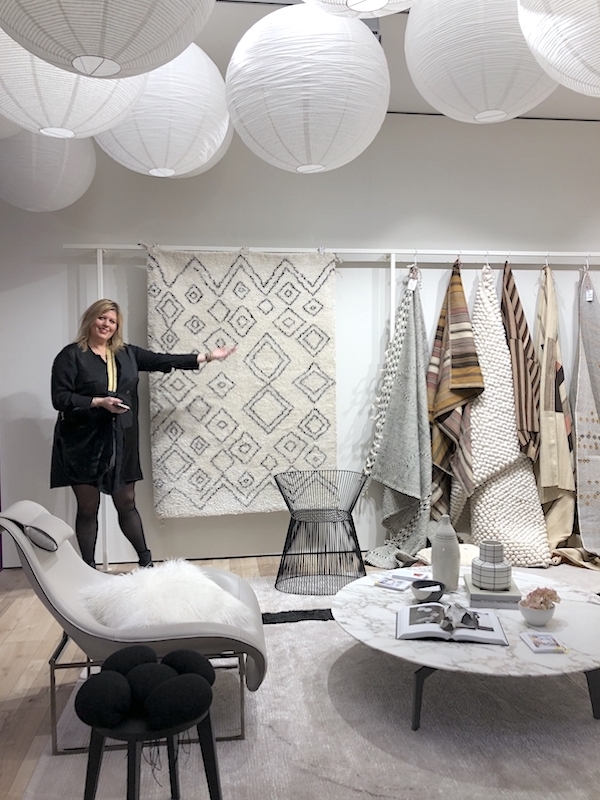 With the same group of bloggers as last year, we visited several brands and joined two discussions for the audience at the "Framing Trends" area, led by Holly Becker. After last year I knew what to expect and that it is impossible to see all I discovered years ago. Being interested mostly in handmade carpets and the story behind the brand, I had a look at the halls where these exhibitioners could be find but also took some time to look at the different other options for floor covering, like parquet and PVC. I recently had some water damage at home and I will need to replace floorings, which made the fair even more interesting. We had a small tour along some brands that Holly of Decor8 selected for us. The great thing about Holly is that she will always take care there is something for everyone of us, as we are with a group of seven, from seven different countries and many different tastes! This is not only great for the fair and the brands, as we have seven different opinions and look on things, but also as a group I think we are fantastic, if I may say so, I just love these strong personalities all together that respect and take care for each other. But enough about us! 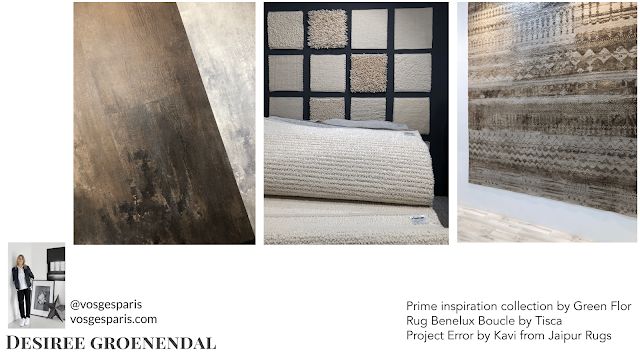 Looking back at Domotex I think that for everyone who visited or is planning to visit the fair next year (10-13 of January 2020) the "Framing Trends" area in Hall 9 is a great starting point. 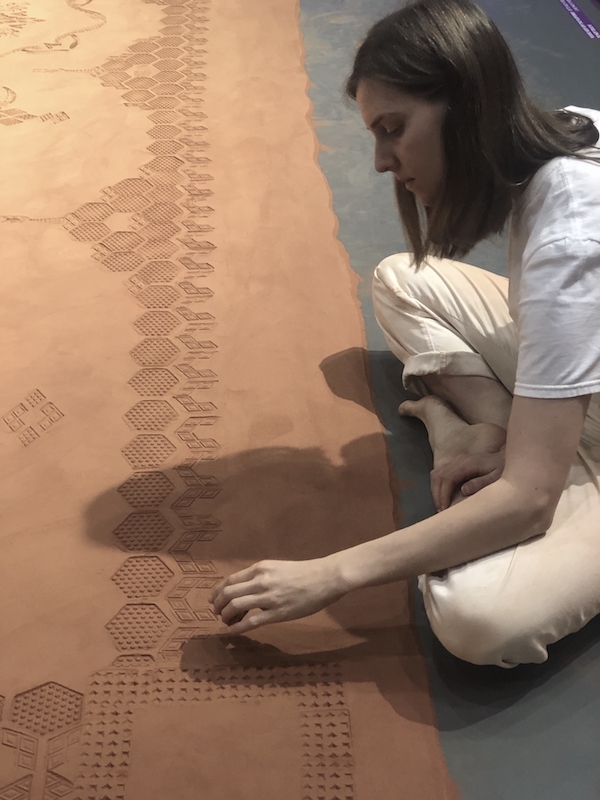 A real visitors and personal favourite was the work of Rena Detrixhe who worked on a rug made out of Red dirt for several days. She told me that 150 kilo of red dirt/sand was shipped from America in order to create this installation, a red rug. It was fascinating to see her work, so calming while creating a real beautiful and huge piece of art. 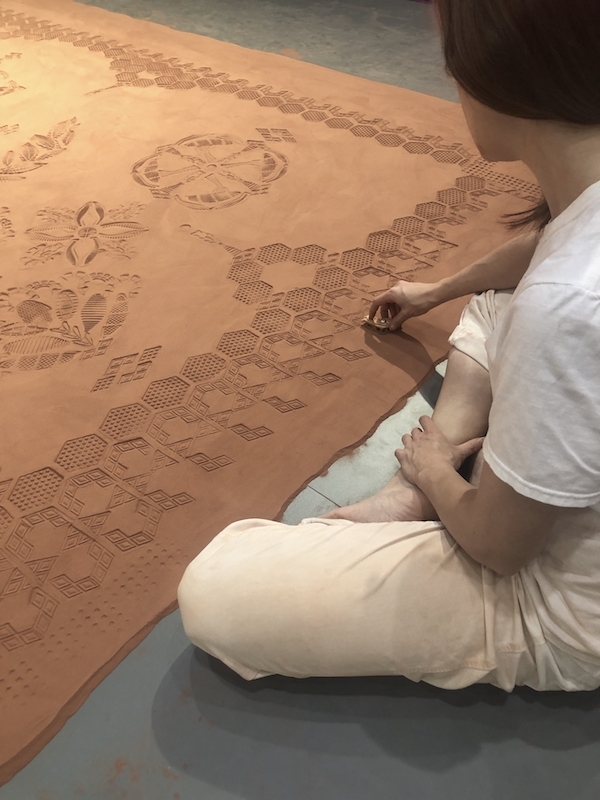 Detrixhe creates the foliate and scrollwork designs of each rug from sneaker treads that she cuts into stamp-like templates, and their “found object” quality injects the precision of the rugs’ designs with a welcome element of improvisation. Sometimes recognizable, the stamped forms recall the well-worn hiker's mantra—"take only photographs, leave only footprints"—and like photographs, they offer personal traces, rather than factual documents, of histories and ecologies outside the gallery walls. 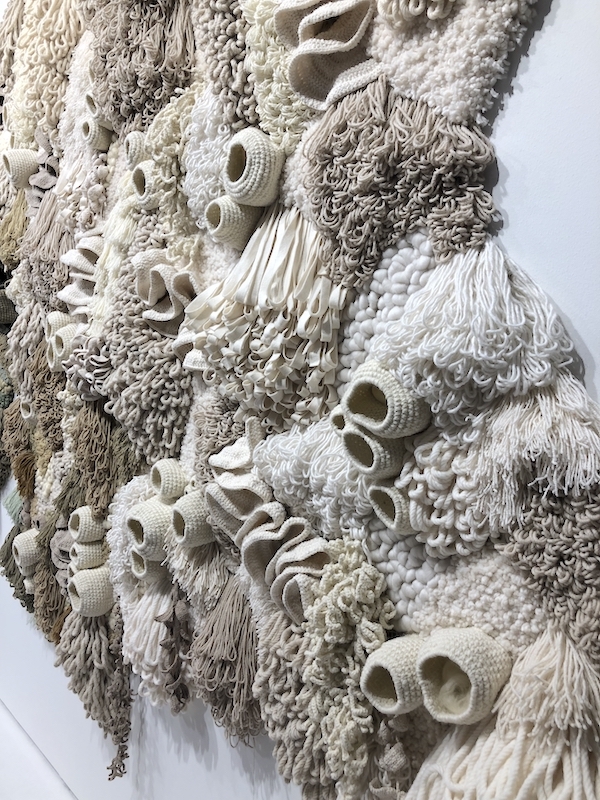 Impressive also the booth where Vanessa Barragoa presented her 'Coral Garden' Textile art installation. 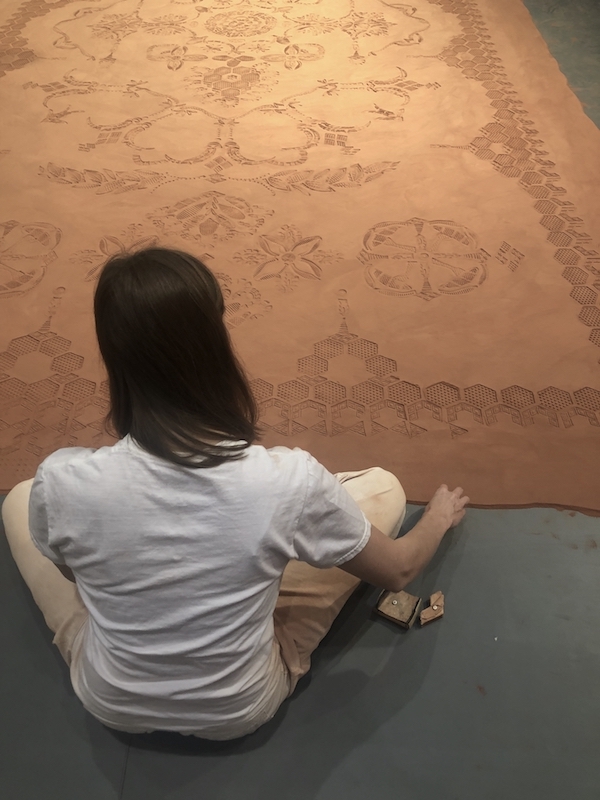 With the mass textile industry being one of the most polluting in the world bringing harm to our planet in mind, she created an installation, with the help of lots of family members. The garden focuses on the problem and how it is deeply affecting coral reef that is the heart of marine species. The colour on the left shows a healthy environment while the white side on the right shows a slowly dying coral reef. Like last year the area showed the latest trends, the Carpet Design award, nominees ánd winners, and there was space for creative workshops. We loved to have our own Blogger area right next to the stage where we had two talks. The booth Holly created with her selection of rugs in collaboration with Farrow & Ball and Hannover based interiors store Steinhoff was directly next to the blogger zone. 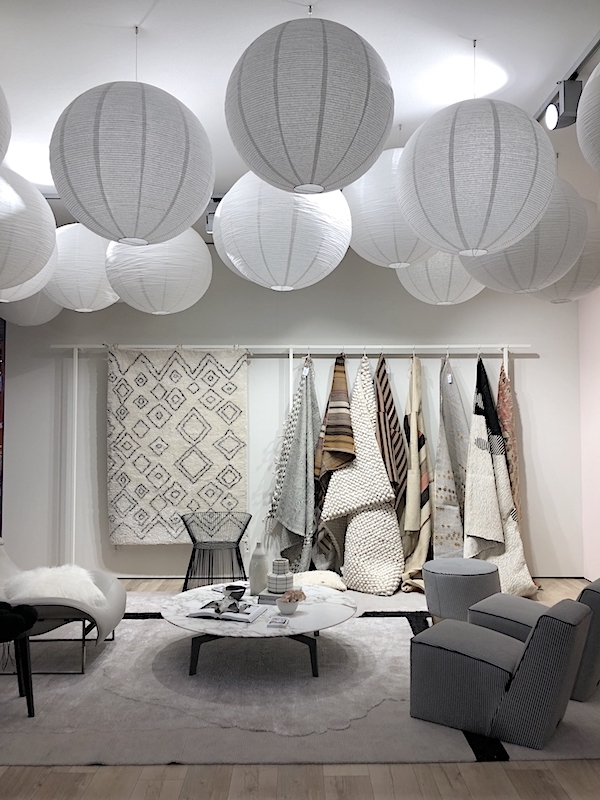 The booth showed beautiful soft walls, a selection of rugs and was styled with different furniture from the Hannover store and also included a few personal items from Holly's home. The ceiling inspired by the New York Noguchi Museum in the US, the country where Holly is born, was done so well with the many paper lamps. 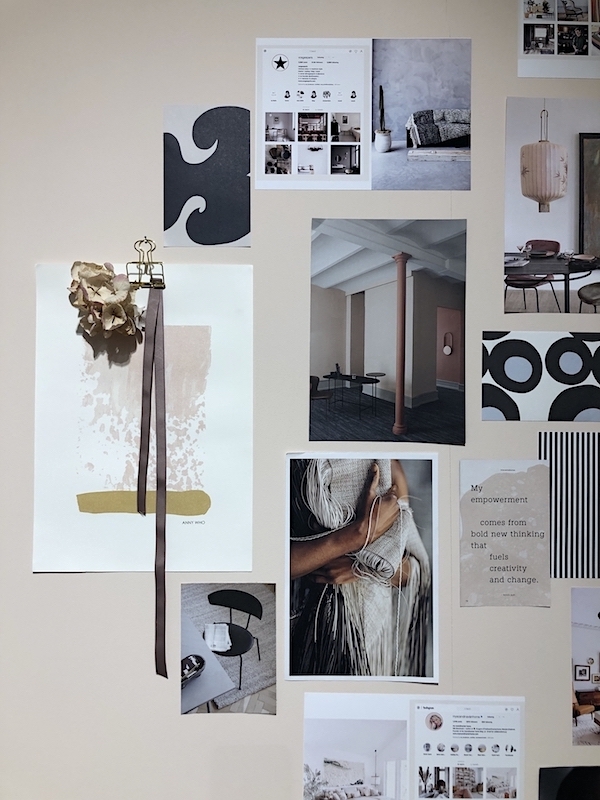 The moodboard on the wall was beautiful showing the trends Holly presented and she also included our team, thank you Holly! 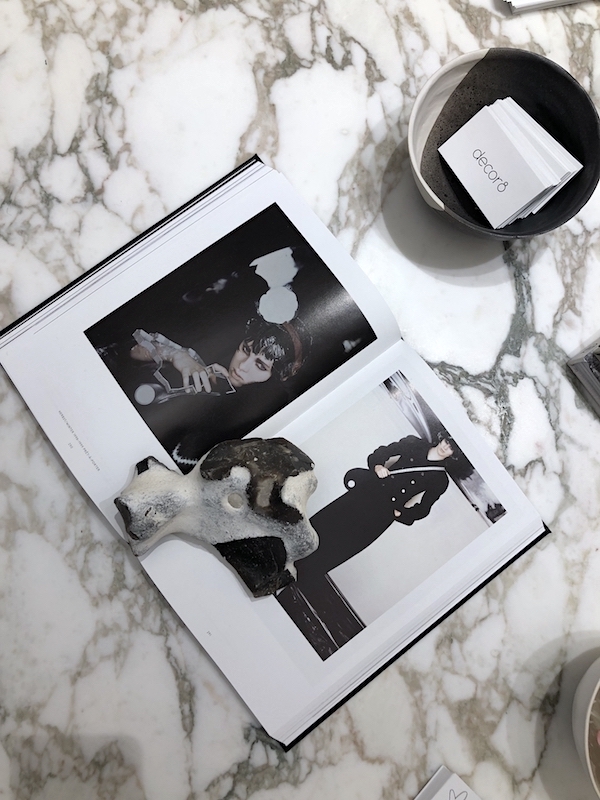 January is an exciting month for Holly, not only will she launch her own magazine with Living at Home, she will also launch a capsule collection for the home this month, congratulations on this great start of the year my friend! A real connection we made with the audience during two panel discussions. 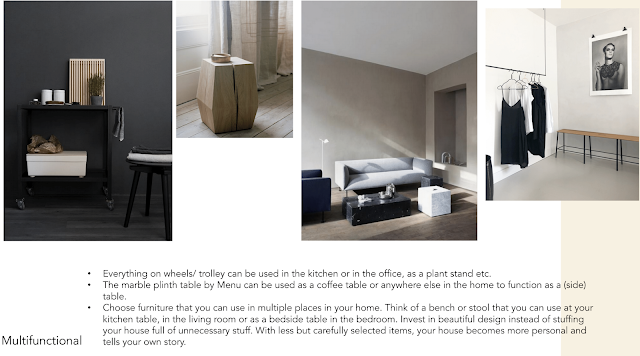 In our first talk we showed the many different things we do and how clients can work with each of us individually. 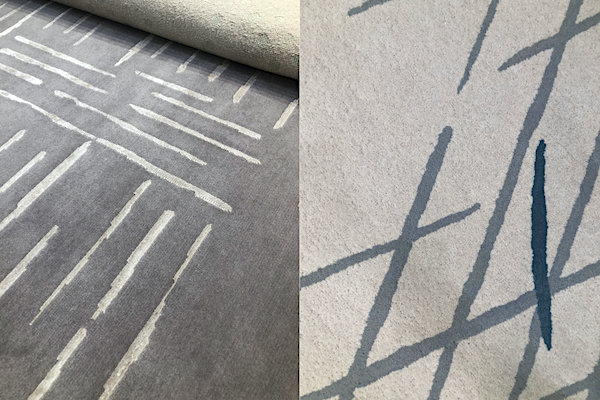 Meeting the designers and exhibitors is something I really enjoy, I think every brand has a story and it is great if a designer takes the time to meet and talk about what brought them to designing carpets. Holly choose different designers who all showed us their highlights. 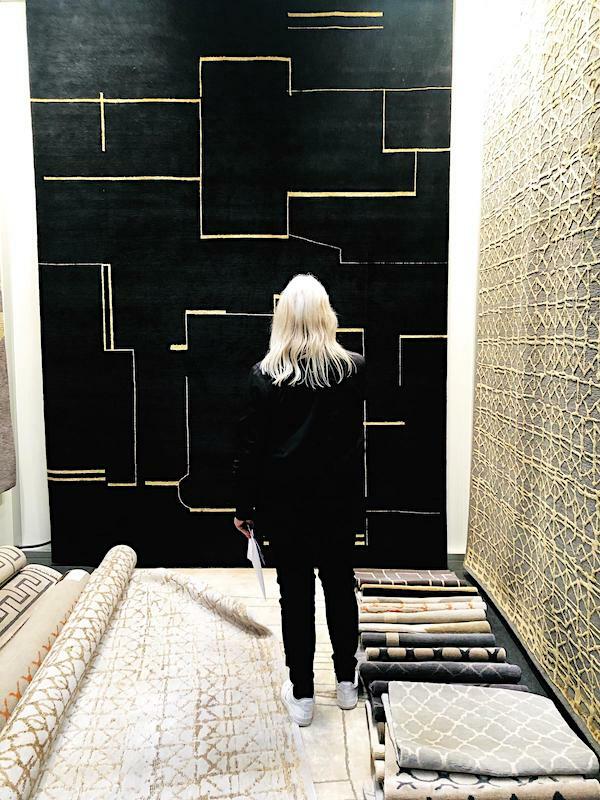 Above a picture from the booth of Kristiina Lassus, with hand knotted rugs made in Nepal. The huge black rug is made from wool and silk and the gold pattern is in silk, If you ever come across a carpet where silk is used, be sure to touch as silk adds a super soft element to a rug! 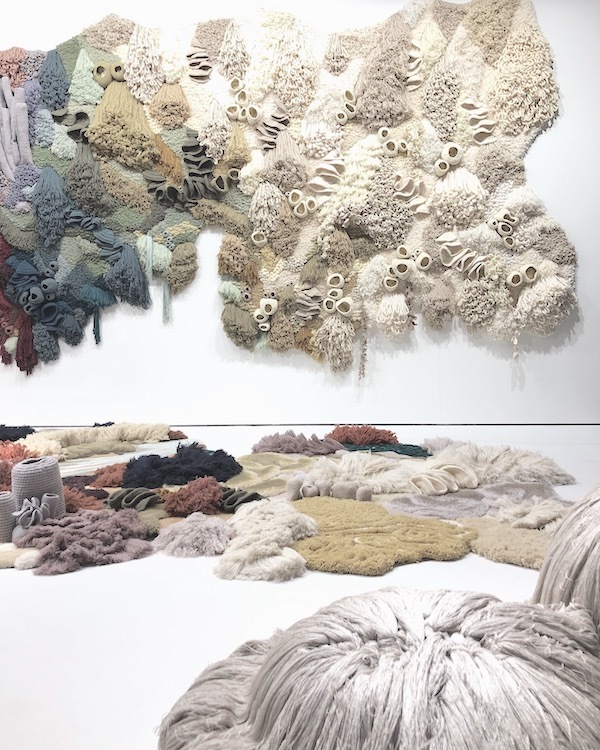 Claire Gaudion is inspired by islands and in cooperation with Dutch Momo Rugs she created three handmade collections of hand woven, hand knotted, and hand tufted rugs. 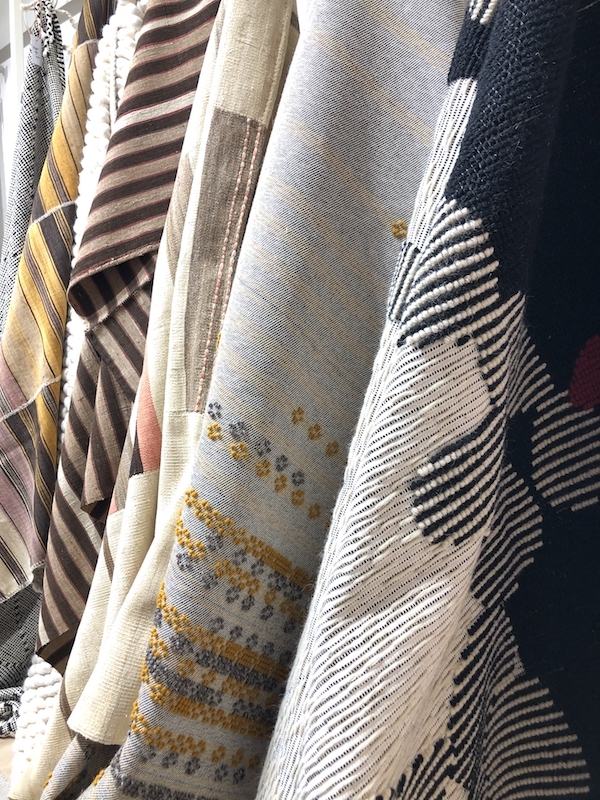 The collection shows inspiration from Guernsey island, where Claire is born, the sea, the changing light and the reefs and coast from the island. Something I have learned at Domotex is that New Zealand wool is one of the best! ÄNG Studios produces high-quality rugs of pure natural materials dyed and washed without using harmful chemicals. For this reason, the rugs are knotted by hand in Nepal and India. 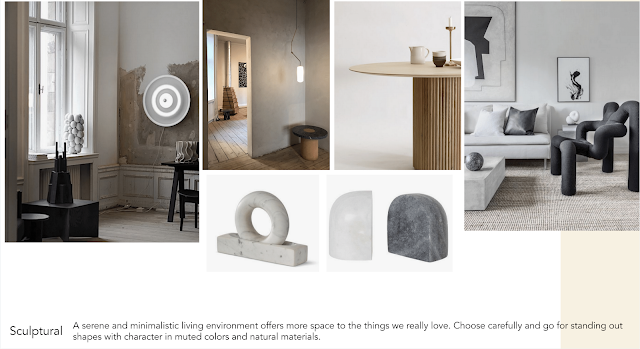 An outdoor collection made out of Himalayan nettle, which is considered as one of the durable of natural fibers is the second collection of this newly established interior design company with a studio and showroom in Stockholm. 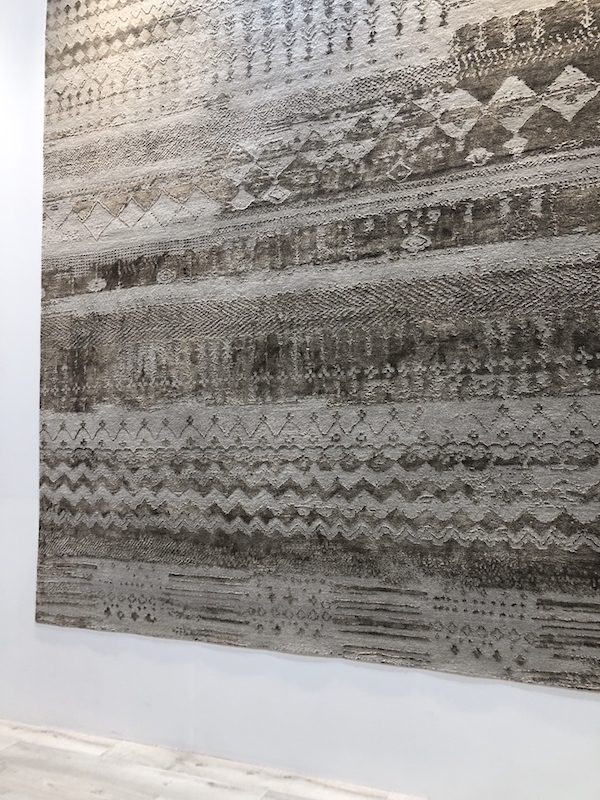 I loved the story of this carpet which is called Project Error by Kavi from Jaipur rugs , Kavi is the designer and when three craftsman started working on this carpet, each of them made their own pattern. Working down they compromised on how it eventually should look. 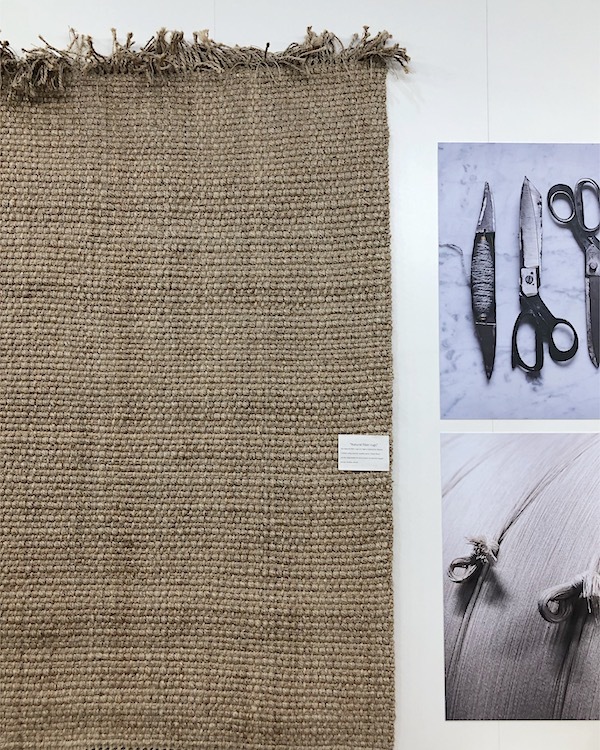 Natur Pur is an Australian label with eco-friendly rugs in natural materials including Sardinian wool which is said to have the longest fibers to work with in the carpet industry. We had a coffee and a picture with the team (pictured on the left) of Natur Pur. 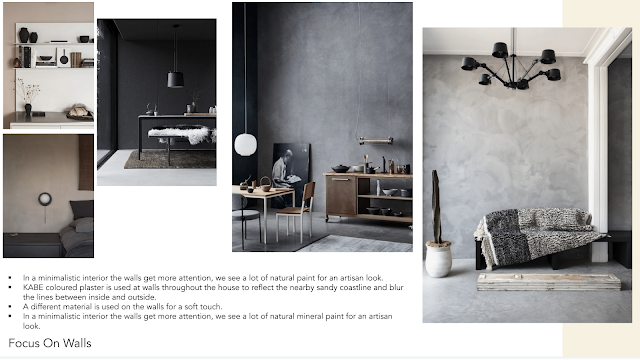 Last year when first visiting I created a Domotex Pinterest board, and like last year I will add all pictures from this post on the board, I will also add all other pictures I made including some from the rest of the team so you will have a good impression of Domotex, check out their blogs as well. 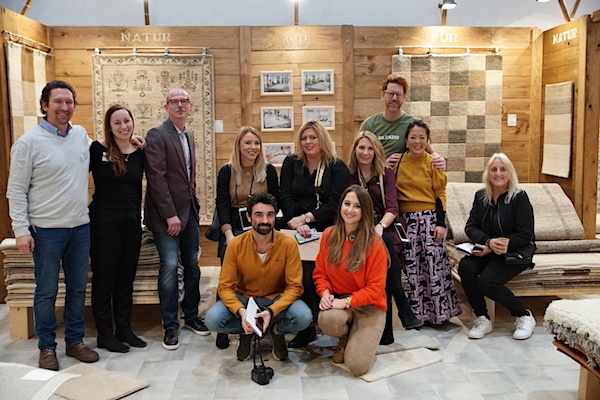 Thank you all for the great time and company... Lars and Domotex, And the team: Stefan from TrendStefan, Niki from My Scandinavian Home, Agata from Passion Shake, Igor from Happy Interior Blog, Mette from Monsterscircus and me Desiree from Vosgesparis. Lovely to also meet Michael Christie The Ruggist from Canada and Camilla Bellini from The Dairy of a Designer who joined us during the tour.